Mexican director Alejandro González Iñárritu’s uncompromisingly hard-hitting debut feature is an astounding drama thriller. It’s disturbing imagery, brilliantly choreographed and filmed, shocks. With his vivid characters and stories – all based loosely on fact – Iñárritu shows us a dark yet realistic side to some of the social levels of his hometown, Mexico City. 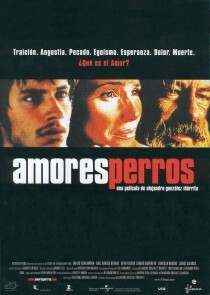 Amores Perros is the first movie in Iñárritu’s trilogy of death. It was followed by 21 Grams (2003) and Babel (2006). All three scripts were written by Guillermo Arriaga. All three films are award-winning must-sees. You can find more information on this Spanish-language movie on Wikipedia and IMDb. Ignore the average IMDb rating – this is a superb film. Again, one of my favs. Great film and good idea for a blog. My husband hates it when I read out reviews from papers or the back of DVDs saying they give too much away. And sometimes at the cinema you feel as if you’ve seen the whole film in a trailer! Another good film. Very well constructed and full of surprises. thanks for the head up that there’s a movie with Gael in it!